Is Christmas really just a few days away now? Where did the time go? Progress on our cars continues to be halted given the season (does performing the clean-car mod count? That’s about all that happens currently) and no meets had been arranged for the month of December. There’s still hope for car fanatics though, as with it being the end of the year we get to witness new vehicles arriving at dealers. 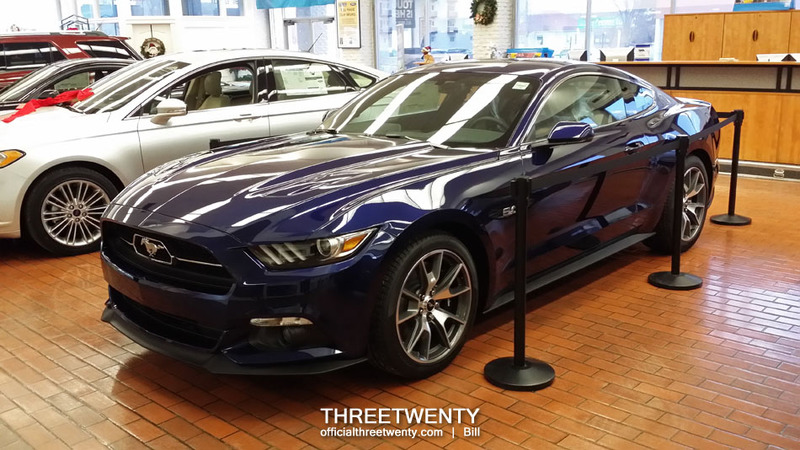 The 2015 model year is especially significant if you’re a Ford fan. Both the Mustang and F-150 received major overhauls and this week for the first time I had the opportunity to see both in person. While the F-150s are seriously nice too, today’s post is specifically about the Mustang. 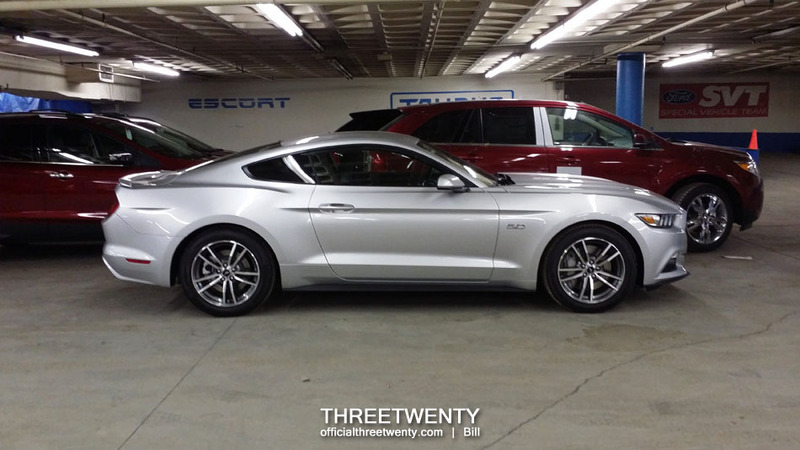 It was about late October that the first new Mustangs arrived in town but I wasn’t able to get to the dealership that had them to take a look. This week during a visit to drop off another copy of the magazine and say hi to friends at Metro Ford I got to see four in person. A beautiful white example (with a red interior, one of my favourite colour combinations) was getting prepped for delivery to a lucky customer. In the showroom sat two more, one black and one blue (above), but it was the fourth which I got to look at in the most detail. It was this Ingot Silver GT, which was free of any optional extras save for rubber floor mats and reverse sensors. 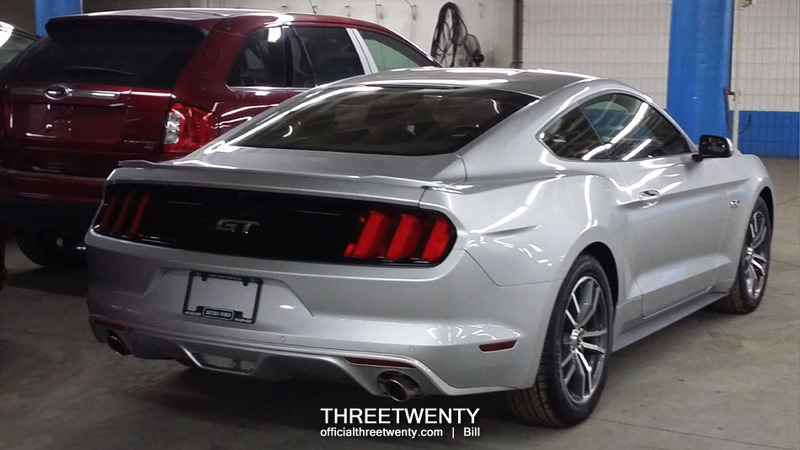 Honestly, it had everything you’d want in a Mustang and the price was really reasonable as a result of the spec. The two important bits in my opinion were both present on this car – a V8 up front with a 6-speed manual behind it. Inside were cloth Recaros and it had all of the features to keep one happy; launch control, accelerometer, and the famous warranty-voiding line lock among others. Upon firing it up, it barely needed any throttle input to announce its presence with that rumbling V8 under the hood. I spent a little while going over the interior, seeing all of the readouts it offered on the display in the gauge cluster, noting the visibility offered from the driver’s seat (not too bad) and even checking out the backup camera. Quite a nice place to be. The exterior could keep one busy for a while too, with the gorgeous new styling and modern touches to admire. The center-mounted reverse light is one of my favourite details, and something that I wish the Foci were treated to. To be picky the wheels were far too sunk for my taste but hey, it’s stock after all. 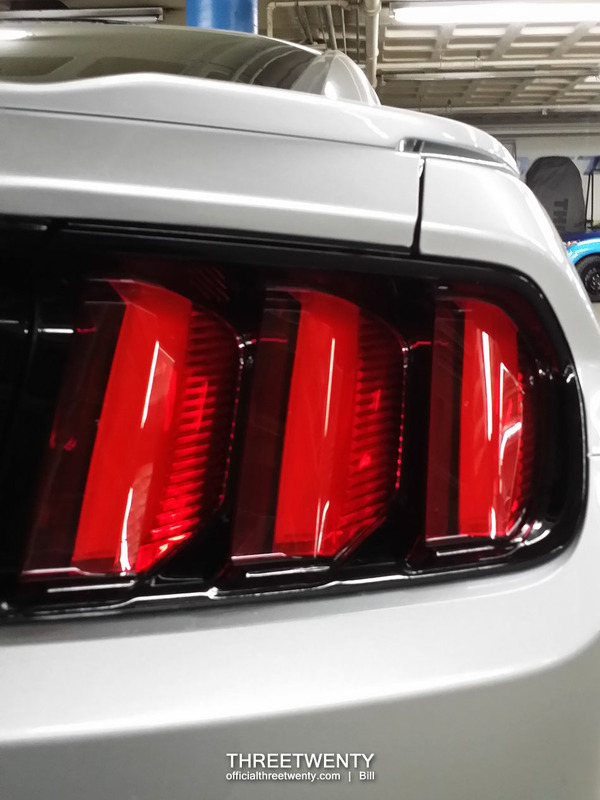 The tail lights are another personal favourite detail, with the iconic design kept and the always-cool sequential turn signals present as well. This was an unplanned encounter so I didn’t have my proper camera on me, but at least I could grab a few photos to share here. I’m looking forward to next summer when there should be a lot more of these on the road and probably popping up at the local meets and shows as well. I’ve been a Mustang fan for as long as I can remember so chances are I’ll be happy upon seeing one, but this one I really liked. The only thing I’d change on this car would be the paint colour. I think it should be a bit brighter than that….perhaps yellow.